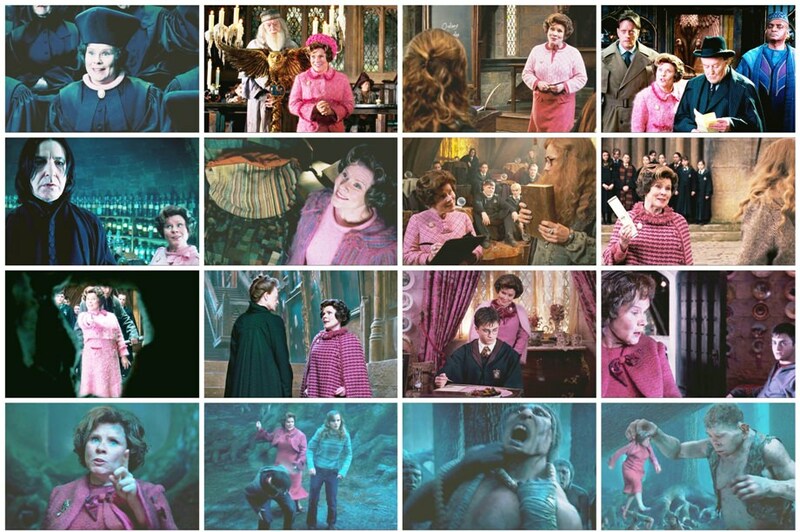 Can you pick the Dolores Umbridge screenshot from Order of the Phoenix that matches the line shown? Lines are taken from the films. Some of them have been shortened to fit the space available (indicated by ellipsis). So silly of me, but it sounded as though you were suggesting that the Ministry had ordered [the dementors'] attack on this boy. How lovely to see all your bright, happy faces smiling up at me. I'm sure we're all going to be very good friends. Using spells? Well, I can't imagine why you would need to use spells in my classroom. [To Dumbledore] We saw your lies for what they were - a smokescreen for your bid to seize control of the Ministry. You applied first for the Defense Against the Dark Arts post, is that correct? But you were unsuccessful? [To Hagrid] If I were you, I shouldn't get too used to being back. In fact, I mightn't bother unpacking at all. Just one question, dear. You've been in this post how long, exactly? To question my practices is to question the Ministry, and by extension the Minister himself. I want you to write 'I must not tell lies'...as many times as it takes for the message to sink in. You leave me with no alternative. The Cruciatus Curse ought to loosen your tongue. You have no business here, centaur. This is a Ministry matter. You filthy animal! Do you know who I am?